The PMDX-131 has been replaced with the PMDX-132. The PMDX-132 is a form, fit, and function direct replacement. Supports G201, G202, G210, and G212 stepper motor drivers. It does NOT support the G320 and G340 servo drivers. The PMDX-131 does not currently support the upcoming G203V drivers. Utilizes standard IEEE-1284 Centronics style printer cable for connection to PC. Connection to PC can also be via a 26 pin ribbon cable which allows a remote DB-25 to be used. Provides LED status indicators on the 5 input and 4 output signals. Supports the MACH "charge pump" signal to inhibit outputs when the MACH software is not running. Inhibits outputs when E-Stop or Fault inputs are asserted. Status inputs have pull-ups to +5 volts and are filtered to suppress noise. They can be driven by 5 volt logic signals or will function directly with a switch contact to ground. All I/O connections are made via wire clamp screw terminal strips. PMDX supplies new 4 position connectors for the stepper motors and the connectors removed from the Gecko drivers are reused as the I/O connectors of the PMDX-131. Auxiliary +5 volt DC output available to power sensors. Interface powered from 120 VAC or 240 VAC. Separate DC supply required for motor drivers. LED to indicate "outputs enabled" status so "charge pump" status can be seen. 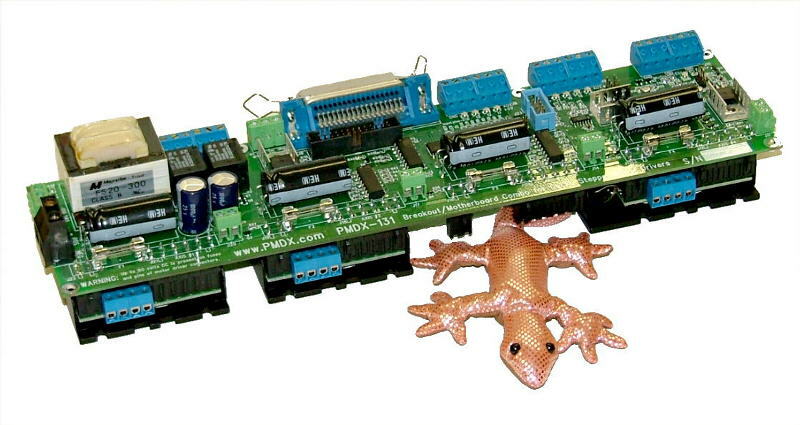 ** Geckodrive, Inc. the maker of the Gecko stepper motor drives does not manufacture, sell, or endorse the PMDX-131. Download the manual in PDF format here (revision 1.7, 530 KB).